Another one of Bangkok's more popular courses despite being a little further out from the city. The 36 holes are designed by Robert Trent Jones Jr. and the appeal is its playability for all levels of golfers. 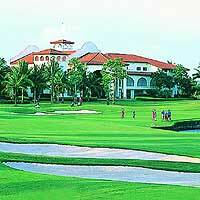 The course is characterized by wide fairways and large greens with each nine offering up something different. Course conditions continue to deteriorate and it's impossible to find a flat lie on a tee box. Because of the extra drive, tee times are usually easier to come by than a lot of other courses. Not too difficult for beginning golfers, yet challenging enough for better players from the back tees. Course conditions seem to get worse every year, carts are not allowed on fairways (they can't get much worse so not sure why), and overall a disappointing golf experience.